Smaller than Cappadocia’s other subterranean cities like Kaymakli and Derinkuyu, Ozkonak Underground City is also much less crowded. On the northern slopes of Mount Idis, as you hunch to stroll the tiny corridors of this ancient city you'll feel very big compared to the people who once lived here. Likely built in the Byzantine era, though perhaps even older, Özkonak Underground City was rediscovered in the '70s by a local farmer who wondered where his excess crop water was going. Turns out it was going into a huge subterranean city stretching ten floors deep and able to house 60,000 people. Reaching a depth of 40 meters in total, today only the first four floors of Özkonak Underground City are open. As you wander the tiny corridors, you'll see the sophistication of the city which had a built-communication system made up of pipes that connected all 10 levels. Look out for holes in the walls too — these provided ventilation in the event that Özkonak city would have to close itself off to the outside world if enemies tried to invade. The underground city also had its own winery and water well, and if enemies did get too close, well Özkonak’s inhabitants were more than ready to pour hot oil on them through secret holes designed for that very purpose. 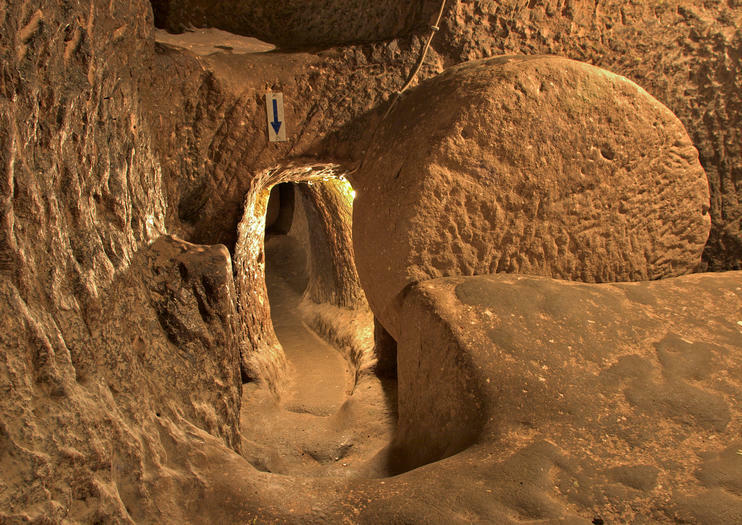 Fourteen kilometers northeast of Avanos, entrance to Özkonak Underground City is 8TL. The site is open every day (8am-7pm in summer, 8am-5pm in winter). On weekdays, you can get there by a dolmus (shared taxi) from Avanis. The journey takes about 30 minutes and drops you off 500 meters from the entrance. Visit Turkey’s most impressive cities on an all-inclusive 10-day tour. Careful organization ensures that you’ll experience the best parts of Turkey without wasting a moment. After a visit to Istanbul hop a plane for Cappadocia. Continue onwards to Ephesus, Konya, and beyond with your guide. This is a fuss-free tour with nine nights of included accommodation. You’ll also enjoy nine organized breakfasts and four dinners. Why paying more for a private tour? Well, you can just lay back and enjoy the comfort of being the only ones to be take care of.Stop when and where ever you want for how long you want.Not being depending on other peoples needs and preferences and surely not overwhelmed with many shopping stops.There will be a luxury mercedes van with bottled water and a felxible itinerary to your disposel.You will enjoy the quality of a professional guide who know how to honor the concept of a private tour. Maximise your time in Cappadocia with a whistle-stop tour of the must-see sights from Nevsehir airport. Not a moment is wasted, as your private guide will pick you up from the airport and whisk you off to attractions such as Ozkonak Underground City, Goreme Open-Air Museum, Cavusin village, Monk’s Valley, Uchisar Castle, and Avanos. Cappadocia offers you every beauty of mother nature to discover. Undergroudn cities, cave houses, valleys and local grapes which are the source of famous Cappadocia wines.Instead of joining a group tour, you can have your own guide who can accompany you through the day so you can customize the program and visit only the sites you want to.